At Fit Werx, our goal is to provide the most consistent builds possible. All bicycles from Fit Werx are designed to provide their owners with the best possible long-term ownership experience and to require as little adjustments as possible. We start with frame and fork alignment and preparation. Here we check to make sure the frame is aligned within Fit Werx’s tolerances which are even tighter than most manufacturers. Next we check the finish on the bicycle to be sure there are no blemishes or defects in craftsmanship. We also record the serial number on multiple documents that you will receive. We flex hone the seat tube to ensure there are no sharp edges or debris inside that could bind the seat post. We apply grease inside the seat tube for steel and alloy frames, anti-seize Ti frames, and carbon paste inside our carbon frames to help ensure the seat post does not slip or corrode. Chasing the Bottom Bracket threads ensures it takes little effort to install the bottom bracket straight and reach the proper torque. Facing the Bottom Bracket shell takes off any additional paint that is left on the outside surface and allows the bottom bracket to fit tightly and flush against the frame. This process keeps the bearings on each side of the bottom bracket aligned so they function smoothly and wear more evenly. You would be surprised just how out of alignment many frames are in this regard and how few shops take time to complete this important step. Moving on to the head tube – We face the external surfaces to ensure the headset bearing are aligned properly. This makes installation smoother and gives you years of smooth bearing operation and minimal wear. Internal headsets are becoming more common now. We also face the internal mounting surfaces for the bearings to ensure proper alignment. The Fork Crown is an often over looked piece of the puzzle. We face this surface when possible to ensure the crown race of the headset is centered and straight on the fork crown. This eliminates any asymmetry in the fork headset junction. Our last step in frame preparation is chasing the threads for the rear derailleur. This step removes any excess paint from the threads and aids in alignment of the derailleur. Moving along in the process, we begin to install the components. The bottom bracket is wrapped with Teflon tape before installation. The frame threads are greased or anti-seized (for titanium) and then the bottom bracket cups are torqued to specifications. The headset is installed next in similar fashion. The frame is coated with grease, or anti seize for titanium, and the headset cups are pressed in with the appropriate adapters to ensure the bearings are not harmed. Notice the logos are correctly aligned, no detail is spared. 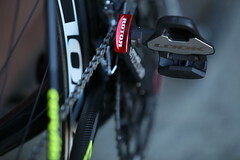 The headset race is installed on the fork with a race setting tool. Grease or carbon paste is applied under the race to ease the stress of installation. The fork is now installed and the bearings are covered with grease to seal from outside contaminants. We now begin to install the components on the frame. This is everyone’s favorite part and it is easy to forget to grease every bolt that is used here. This makes the proper torque easy to achieve and also keeps them from seizing in place over time. The crank goes in first and all bolts are greased as well as all bearing surfaces. The final step is ensuring proper torque of all bolts. Derailleurs are the next components to be installed. The mounting bolt on the rear derailleur is greased and attached to the frame. The front derailleur is a bit more involved to mount properly. The height and rotation of the front derailleur are crucial. We align the outer cage of the derailleur parallel with the outer ring of the crank set. 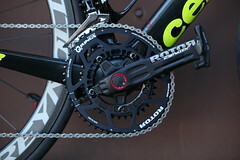 We also set the height of the cage 1-2mm above the teeth of the chainring. We grease the fixing bolt and torque to spec. Installation of the brakes is a very straightforward affair. We grease the mounting bolts and use longer bolts when required by carbon frames. 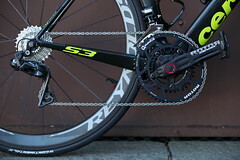 The chain is cut to length for each bike and left with extra room to use lower gearing when possible. We then install the chain per the manufacturer’s directions to ensure highest strength. We begin installing the components that the rider will contact. These components are installed to the position dictated by the frame template. The stem is placed at the proper angle with the correct number of spacer below to achieve the correct handlebar position. The stem bolts are then torque to spec. The handlebar is mounted in the stem and rotated to the proper position. The face plate mounting bolts are torque to the spec allowed by the handlebar manufacturer.The shifters are installed once the handlebar position is dialed in. We use a straight edge off the flat section of the bar to ensure that each lever is symmetrical to the other. The saddle rounds out this section in the checklist. The saddle clamp bolt on the seat post is greased and the saddle is mounted to the position dictated by the template. Wheels are a very dynamic part of the bicycle. Every pedal stroke accelerates them and every bump in the road is transmitted through them. Brand new wheels from the factory can have lots of issues. We take each wheel we sell and manually pre-stress each spoke to insure they are properly set in the hub and rim. We then true and dish each wheel to our personal spec to make sure the spokes are uniform in tension and the wheel can run true for years to come. Once the wheels have been tuned it is time to install the tires. We replace any factory rim strips that are in bad condition with Velox rim tape. We install the tires with the labels over the valve holes and apply a coating of baby powder to the inside before installing the tubes. We then fully inflate the tires. We grease the cassette and locking before installing to make removal easier in the future. The skewers are greased and installed into the hubs. Then the wheels are mounted to the frame with the correct quick release tension. The cable housing is routed in the smoothest possible manner and cut to length accordingly. The ends of the housing are ground down to be smooth and leave no burrs to snag the cable. This step ensures the cables will run as efficiently as possible. As the cables are inserted into the housing a thin layer of Teflon lube is added to aid in the shifting and braking smoothness. When we have the cable all run we begin to adjust the brakes and derailleurs. 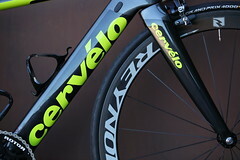 The limits on the derailleurs are set to prevent over shifting. The B tension screw is adjusted to position the upper pulley in the closest possible position to the cassette. The brake pads are adjusted to the center of the braking surface and slightly toed in to provide maximum braking force. On aero bikes, we add tension to the rear brake spring to aid in lever feel. At this point all cables are firmly stretched to make sure the housing and ferrules have settled in firmly. This pre-stretches the cable to minimize future adjustments. All brakes and derailleurs are then readjusted.The cable ends are then cut 5cm past the anchor bolts to allow easy future adjustments. All cable ends are soldered to keep them from fraying and make it easy to rethread them when the bicycle is shipped. The final step in the build finishes off the bicycle with a professional touch. We wrap the bars from the bottom to the top and from the inside out to keep the tape from unwrapping under normal riding conditions. We clean the manufacturer’s grease off the chain and apply a Teflon lube to the chain to keep from attracting too much dirt. 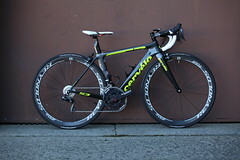 We install and calibrate any additional accessories such as computers and water bottle cages making sure all wires and cables are secure and cleanly routed.Once all the work has been completed the bike gets a final polish to give it that shine. The last touch is the Fit Werx decal.The bike is now ridden and put through its paces to make sure the bicycle is performing as it should. Once the test ride is completed the bicycle is fine tuned again and all the bolts are checked for proper torque. We also weigh the bike and record it on your checklist. Here is the finished product, all shiny and ready for the customer. Along with the actual bicycle you will receive all the manuals that come with the components as well as our build checklist ensuring we have completed each step. Your warranty information will be completed and filed by us promptly after pick-up.